Gwalior is an important city of Madhya Pradesh, India. It is situated 122 kilometers south of Agra, and 423 kilometers north of Bhopal, the state capital. Gwalior occupies a strategic location in the Gird region of India, with city and its fortress having served as the center of several historic northern Indian kingdoms. Gwalior is the administrative headquarters of Gwalior district and Gwalior division. 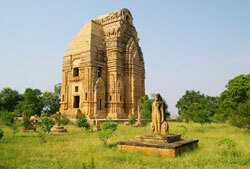 It is famous for Gwalior Fort, which has changed hands many times. From the Tomar's in the 8th century it passed on to the Mughals, then to Marathas under the Scindias (1754), followed briefly by Lakshmi Bai of Jhansi, Tatiya Tope and the British. The city has several important educational institutions including the Atal Bihari Vajpayee - Indian Institute of Information Technology and Management, Indian Institute of Travel and Tourism Management, Madhav Institute of Technology and Science, Laxmibai National Institute of Physical Education. Gwalior has five government universities: Jiwaji university, Maharaja Maan Singh Tomar music and arts university, Rajmata Vijyarahe Scindia agriculture university, Laxmibai National University of Physical Education and ABV-IIITM. Gwalior is often seen as the headquarters of the Chambal Region, and it is covered by Industrial and commercial zones of neighboring districts ( malanpur - Bhind, Banmor - morena) all the three main directions. Gwalior is the fourth largest city of Madhya Pradesh and is often referred to as the tourist capital of the state. 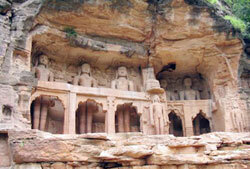 Gwalior was the capital of Madhya Bharat before the creation of the Madhya Pradesh state in 1957 [1947-1956]. The Fort: There is much to see in and around the gwalior fort. Guides can be hired at the gate. Every evening light-and-sound show is held at the open-air theater outside the Man Singh Palace at fort. Jain Sculptures: There are many impressive and large Jain Sculptures, originally cut into the cliff faces in the 15th century. 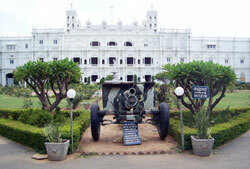 However as situated in the campus of Gujri Mahal. They were defaced during Mughal time. The images are in five main groups. Archaeological Museum: It houses an extensive collection of Hindu and Jain sculptures and copies of the Caves frescos including the famous 'Shall Bhanjika'. Jai Vilas Palace and Scindia Museum: Though the Scindia family still dwells in this Palace, a part has been converted into museum. The museum houses ostentatious items such as Belgian cut glass furniture, stuffed tigers, a Rolls Royce on rails, a German bubble car, a life-size marble statue of Leda and a silver railway that carried brandy and cigars around the dining table. The main Durbar hall with its giant chandeliers is captivating. Tighara Lake: Approx. 20 kms from the city of Gwalior is huge lake where water sports are available on nominal payment apart from being a nice place for picnics in monsoon season. It also fed water to the water filtration plant supplying filtered water to gwalior city since 1920. Motimahal Palace: A place which was turned into a Govt. Office in Independent India has beautiful painted ceilings and walls, recently renovated by INTACH in its original grandeur. 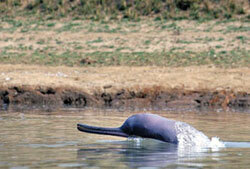 Chambal Safari: Dolphin & Crocodiles are breeded and can be seen in Chambal river by Chambal Safari boats run by MPSTDC.